The Leviticus system provides day-to-day power needs of VAD implants -- wirelessly -- to eliminate drive line complications. Carmel HaLevy of Leviticus Cardio explains the system to visitors at Biomed 2018. 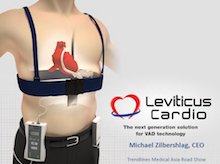 Leviticus Cardio is developing a wireless system able to provide the day-to-day power needs of VAD implants while eliminating the complications related to the drive line. 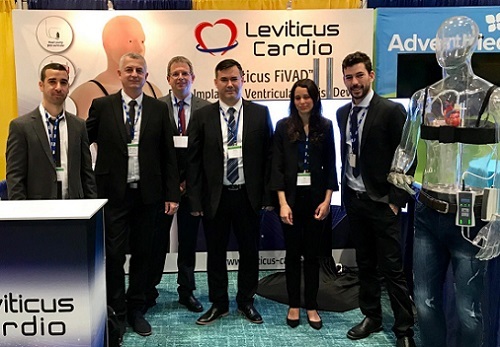 The Leviticus Cardio R&D team at the International Society for Heart & Lung Transplantation (ISHLT) Annual Meeting, Orlando, Florida, 3-6 April 2019 (l to r): Integration Engineer Eli Asulin, CEO Michael Zilbershlag, Director R&D Neri Naveh, Embedded Software Manager Denis Yurchenko, Biomedical Engineer Yael Priz, Project Leader Haim Yaniv. More than 120 doctors participated in the Leviticus and Jarvik Heart symposium at ISHLT. See the interview with CEO Michael Zilbershlag from i24News. Meet the patient with the Leviticus fully implanted ventricular assist devices (FIVAD). See the Leviticus Cardio product animation. 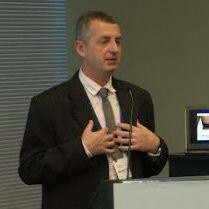 CEO Michael Zilbershlag presents at an Asia Road Show event. Michael Zilbershlag presents at a Trendlines' Showcase. Thousands of patients each year are candidates for heart transplantation. An alternative to heart transplantation is the ventricular assist device (VAD), an implanted mechanical circulatory pump that is increasingly being used to support patients with heart failure. To supply power to the pump, the VAD is connected to an external power pack by a transcutaneous drive line. The exit site of the drive line on the abdomen provides a port of entry for pathogens, making VAD recipients highly vulnerable to device-related infections. Infection and reduction in quality of life (both related to the drive line) represent the most important challenge to extended VAD use. Leviticus estimates the TAM for its CET system at $900 million. Players in the VAD market include St. Jude Medical, HeartWare, Jarvik Heart, Cleveland Heart, Sunshine Heart, CorWave, Rein VAD (AME), Calon Cardio, Berlin Heart, and Relight Heart. *Congestive Heart Failure (CHF) Treatment Devices Market Analysis by Product (Ventricular Assist Devices, Counter Pulsation Devices, Implantable Cardioverter Defibrillators, Pacemakers, Cardiac Resynchronization Therapy) And Segment Forecasts to 2024. Grand View Research, October 2016.